Exterior angle, of the Pegasus. We can see that the ship is just now approaching the edge of the Land beneath, where the landmass tapers, then ends, falling into nothingness. A faint shimmer is forming around the prow of the ship. CREW are literally racing to take position, some of them threading their arms through the shrouds, others coiling length of ropes about their arms – bracing, as said. WESTFIELD is on the quarterdeck, bellowing orders. 1. WEST:	—brace brace brace! 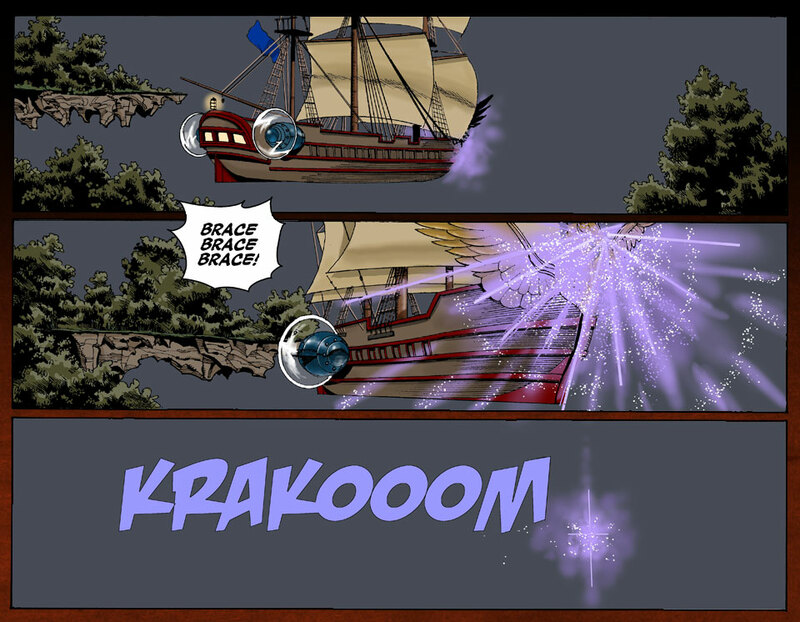 The prow of the Pegasus, seeming to press against an invisible wall, the shimmer of Aether manifesting around the ship as it begins to break through. Longshot, the PEGASUS shoots out into the nothingness of the Aether, leaving a glowing nimbus in its wake. I think Krakoom and its variants are my favorite comic book sound effect. I absolutely agree. I think I’ve spent more time in search of the appropriate “bass-evoking” sound effect than any one rightly should. I was always fond of BA-THROOM!! myself. Seems that’s a sound effect of an entirely different movement. I agree. Krakoom makes me think of a sonic boom which appears to be what you were going for here. I will never, ever forget reading the word, “KRAKATHOOOOM!! !” It was lettered by John Workman in the now-classic issues of Thor by Walter Simonson. I’ve always been fond of Michael T Gilbert’s “Crack-A-Boom!” effect, myself. Love the way the strip’s moving along, by the way! Seeing the outskirts, the last piece of land there before the Aether, it’s made me wonder about the type of wildlife that populate the good Captain’s world. What could be rummaging around in those bushes, if anything? Purple Snipe and Dwarf Baers. Interesting. I had though the aether was just upthere and keep going and your lighter than air wood hull got you there. But apparently the aether is some sort of other-space you crossover to by passing some point with a definite transition. Still unclear if the transition just happens as you move or if there is some sort of figure head/hull composition required for the barrier/transition/crossover to take place. I guess this explans the aether storms a bit more as as forced transition points ripping across “solid” land and changing things. 1. That neither Drake nor Drum get Aether-sick from the turbulence. 2. That Sabre isn’t the sort of person to get cheap amusement from seeing other people get Aether-sick. …Huh. Did not see that coming.